My 12th week in Amy Johnson Crow’s “52 Ancestors in 52 Weeks” family history blogging challenge. I’m a few weeks behind in this series. Just been very busy. But I’m determined to chronicle at least 52 Ancestors this year, so I’m playing catch-up. This 12th ancestor is Walter Ward (born 05 May 1916), a recently discovered sibling of my grandfather Michael John Flanagan (1927-1997). 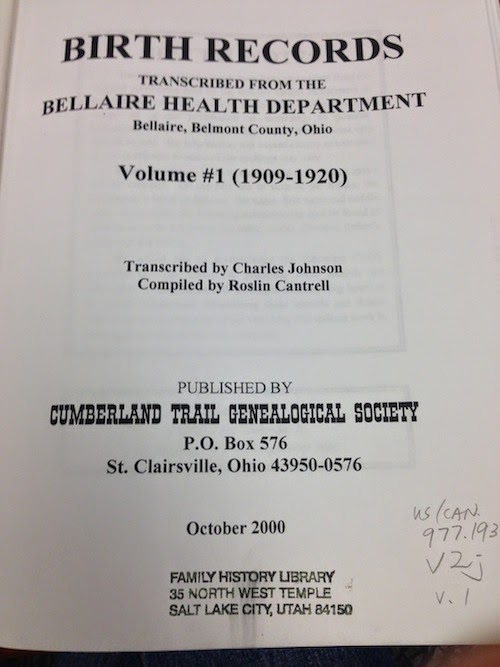 I had never even heard of Walter until I spent a couple of days scouring through transcriptions of birth records from the Bellaire (Ohio) Health Department during my trip to RootsTech and the Family History Library last month. Going through all birth entries for the surname Ward — my grandfather’s mother Sarah Kennedy (d. 1930) was first married to Frank J. Ward prior to her marriage to my great grandfather Patrick Thomas Flanagan — I came across an entry for an unknown Walter Ward, born to Frank Ward and Sarah Kanedy [Kennedy]. Since returning home, I have gone through all of my Ward and Flanagan records, and I still find no other mention of a Walter. Searching records in both Ancestry and FamilySearch, I find other Walter Wards from Ohio, but nothing cross-referencing any of our family names to verify further biographical details. 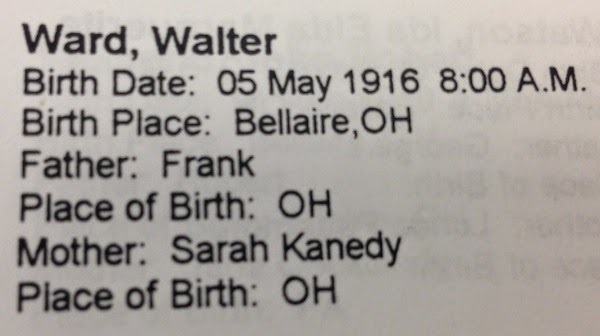 I can’t imagine there was another set of parents named Frank Ward and Sarah Kennedy in Bellaire, Ohio at this the time Walter was born. So this Walter has to be part of my family. Catherine Mae Ward (b. 1914): Father Frank Ward. Birth record confirmed. Joseph A. Ward (b. 1916): Father assumed to be Frank Ward. No birth record found. Orphan records identify him with surname “Flanagan”, as the son of Patrick Flanagan. Leonard Ward (b. 1917): Father Frank Ward. Birth record confirmed. Despite orphan records identifying him with surname “Flanagan”, as the son of Patrick Flanagan. Harry J. Flanagan (b. 1920): Unknown if father was Frank Ward or Patrick Flanagan, or if he is Patrick’s son from a previous marriage (meaning not Sarah’s son at all). No birth record found yet. Patrick and Sarah were married 5 years later in 1925. Orphan records identify him with surname “Flanagan”, as the son of Patrick Flanagan. Patrick Joseph Flanagan (b. 1925): Birth and baptism certificates record father as Patrick Flanagan. Michael John Flanagan (b. 1927): My grandfather. 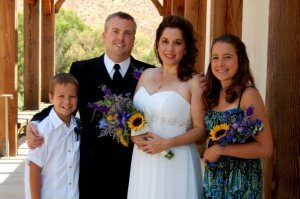 Baptism records father as Patrick Flanagan. This Walter discovery confuses things even more. Because he was born in 1916, and definitely to Sarah and Frank. Yet my orphan records for the Flanagan boys indicate that Joseph was also born in 1916. I find Joseph on the 1920 Census living with his mother Sarah, sister Catherine, brother Leonard, grandmother Catherine, and uncle Andrew. But there is no Walter living with them on the 1920 Census, and I find no 1920 Census record for father Frank to see if Walter was living with him instead. Most confusing is that Walter does not appear on the orphan records for all the boys when their parents died. Unlike older sister Catherine, he would not have been old enough to be living on his own. At his age, he would have been institutionalized with the rest of his brothers. 1930 U.S. Census Record for the brothers, while living in the German Roman Catholic Orphan Asylum in Buffalo, New York. Image courtesy of Ancestry.com. Click image for a larger view. Could Walter Ward really be Joseph Ward, for some reason recorded under a different first name at birth? I haven’t found a birth record for Joseph. Or even a birth date for Joseph, just an estimated birth year. Or could Walter possibly have been a twin of Joseph’s that died young? In which case, why is there a birth record for Walter, but not for Joseph?